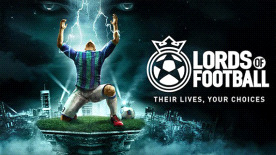 Lords of Football is a whole new sports lifestyle simulator, played in God Mode.The everyday routine of football is brought to life, simulating footballers' training to improve their skills and all the drama and real-life distractions that unfold during a normal season. With easy drag-and-drop navigation and by learning each footballer's personality, you must oversee all your footballers and resources to bring the team up to international competition level. The game takes place in an immersive 3D world with a customisable team, and rewards success with club upgrades to expand this exciting, vibrant football simulation.